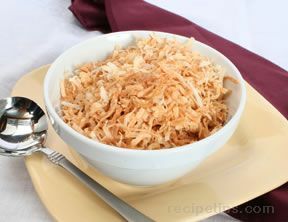 Sweet and crisp, toasted coconut adds eye appeal and flavor to a topping for a variety of desserts. On a large baking sheet, spread flaked coconut out evenly and bake 10 to 12 minutes or until light golden brown. Remove from oven and cool completely before using.